We here at Xtracycle are all about that bike life but sometimes, your bike needs to hitch a ride too. To the bike shop, on a family vacation, to the trail head, into the city. Check out all the ways to make your bike the passenger! 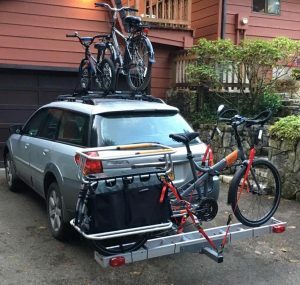 Using a hitch rack: If you have a 2″ hitch, we hands down recommend the Hollywood Sport Rider SE that is rated to carry two bikes weighing up to 80 lb each. This rack can also accommodate the longer 60″ wheelbase of the EdgeRunner. This rack is available on our website here. If using another rack, be sure to read the manual to see what the maximum weight load of the rack is. You can calculate your bike’s weight here. Keep in mind that when carrying your cargo bike on the rear of your car, your bike might be wider than your side mirrors. In some states, bikes on the back of your car must be more narrow than your side mirror. You can reduce your bike’s length by removing the front wheel. 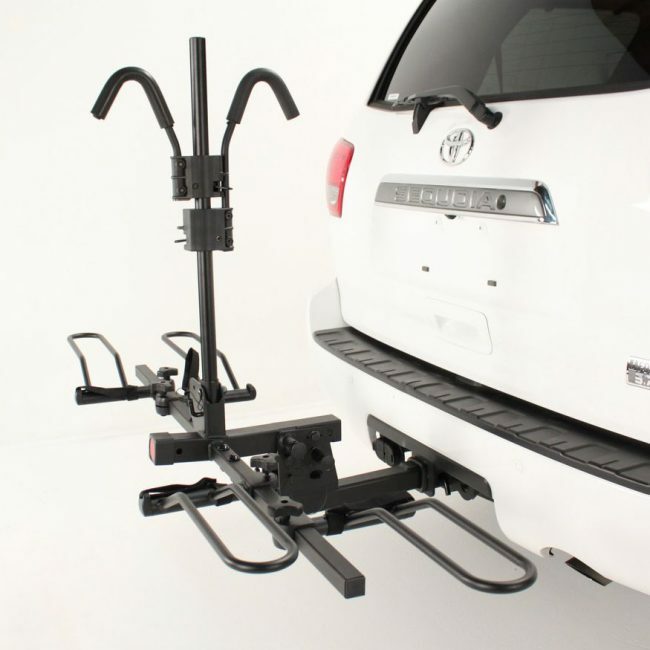 Another hitch option that some of our riders have used with success is a motorcycle hitch rack. Black Widow makes a hitch mounted folding motorcycle rack that can hold one bike and comes with a loading ramp. Inside a car, van or wagon: The EdgeRunner, with Hooptie, U-Tubes and front wheel removed will fit in the back of many vans and wagons. In the included picture, a EdgeRunner was loaded into a 2011 Toyota RAV4 with one rear seat folded down. This left room for the driver and two passengers. When transporting your bike inside your car, be sure to lash it down to something secure (like a lashing point or handle) to prevent it from moving too much during transportation. We have also heard of customers transporting them in a Prius with the rear seat folded down and accessories removed. In a truck bed: Trucks can also carry an EdgeRunner. The Xtracycle team has used a carshare Toyota Tacoma with a standard length bed and can get 3-4 EdgeRunners in there at a time. The key tips are: Tail in first; Pad the back of the bed to keep the tailpiece of the bike from getting dinged; Once the bike is in, secure it with the front wheel on the open tailgate, or with the front wheel turned and the tailgate closed. The seat rails are a convenient place to hook tie-downs onto. Another low cost truck rental option for quick trips in town would be an hourly rental from a local hardware store, like Home Depot or U-Hual. 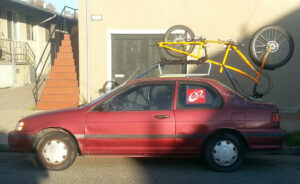 On a trailer: Some customers have had a lot of success in transporting their bikes using a trailer towed behind their car, in the same way one would transport a motorcycle using their car. Be sure to properly secure your bike in the trailer so it is solidly in there and won’t shift or move during transportation. On your roof, using a tandem tray: This works for standard 2- or 4-door cars but if you have a hatchback, make sure that the rear door will clear the end of a tandem length tray. Thule and RockyMounts both offer tandem trays. The load capacity of the Thule rack is 55 lb so you would need to remove the V-racks on your bike along with the bags and Hooptie as well as any other accessories (like U-tubes). The weight of an electric EdgeRunner would be too heavy for this type of carrying options. Putting a bike on the roof of your car is inherently risky – use team lift and be careful not to injure yourself lifting the bike. Always remove the bags before driving and secure the bike in various spots with tie-downs in case the tray locking mechanism fails. On your roof, no rack: With proper padding and cam straps, you can even carry an Xtracycle with no rack! Get help in loading and be sure to remove the bags. Be warned – standard rear mounted bike carriers are not recommended for the EdgeRunner. The EdgeRunner is longer than most cars are wide, and strap-on rear carriers are generally not rated for the weight of a fully kitted out EdgeRunner. Besides the one mentioned above, most hitch-mounted rear tray style bike racks are also not suitable due to the bike’s wheelbase. Most bus front trays are too short to easily accommodate a longtail. That said, you can remove the front wheel, put the fork in the tray, and secure the bike using the J-bar over the top-tube, as shown above. See full instructions at: Aaron’s Bike Repair – Xtracycle (Third party site). Bus rear racks (the hanging kind) work great. Just hang it up like you would any other bike. 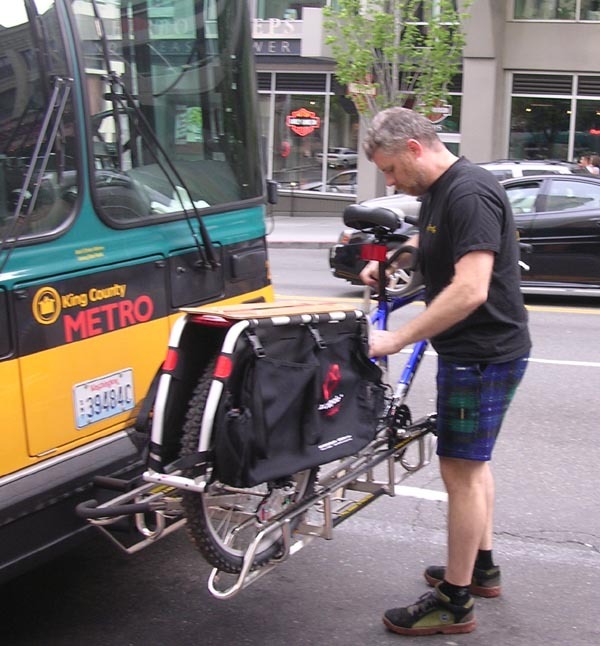 Internal bus cargo compartments (like on Greyhound buses) are a mixed bag – some lines will let you bring your bike, others won’t, and none will guarantee what shape your bike will be in at the end of the trip. Ask the bus company what their regulations are well in advance. The Xtracycle team has been able to transport Xtracycles on the San Francisco area BART train, although getting it down stairs or upstairs to the train platform can take some planning. Have you had success taking your cargo bike long term on a train? Let us know and we’ll update this article to help others! Different carriers have different fees, but the general rule is to pack the bike as if you were shipping it via UPS Ground: Sturdy cardboard box, lots of padding, and all pieces well secured. If packed well, the EdgeRunner can be carried on many domestic and international flights, but again, make sure to check your carrier’s specific regulations for box sizes and weights. Note: Electric bikes use Lithium batteries, generally of a wattage that precludes carrying them on planes. Check with the carrier for their specific regulations. Most car ferries have no problem taking a bike, electric or not. Check with the operator for their specific rules, and where to board. 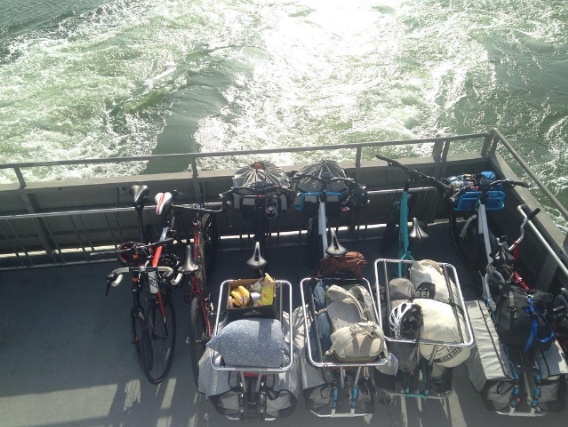 Passenger only ferries will often allow bikes, including e-bikes and tandems if space allows. Again, make sure to check with the operator for their rules. The Blue and Gold ferry in the San Francisco Bay Area allows electric cargo bikes. 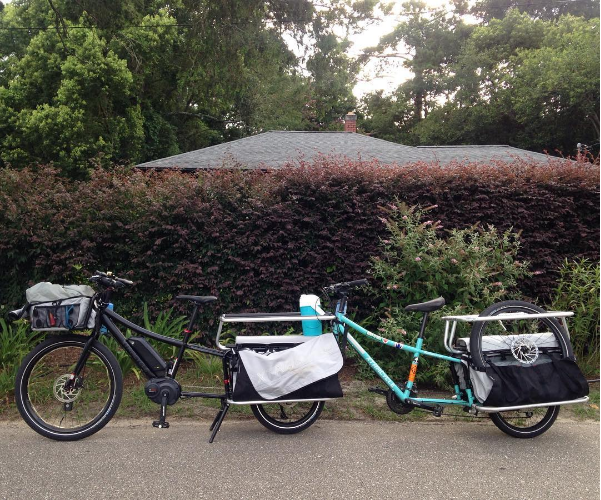 The easiest way to transport a cargo bike a short distance is to tow it with another cargo bike! Many motorcycle towing companies will happily move an e-Cargo bike for you, and the rates tend to be quite reasonable. If you’re car-free or car-lite and you need to get your bike serviced, motorcycle towing companies are a great option. 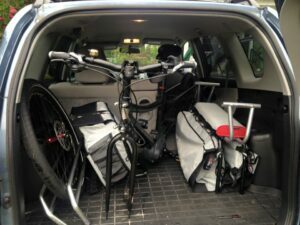 Have additional questions about loading an Xtracycle on or in your car or anything we can add to our list? We’d love to hear it!